WIS-PhagoTracker is a software application for quantitative analysis of high throughput cell migration assay. The cell migration assay is based on a modified Phagokinetic tracks procedure, in which motile cells "leave their tracks" on a specialized surface. These tracks are visualized using a screening microscope. WIS-PhagoTracker enables morphometric analysis of such tracks. It uses multiscale segmentation algorithm for fine detection of tracks and cells boundaries. Following the segmentation step, it quantifies various morphometric parameters for each track, such as track area, perimeter, major and minor axis and solidity. All these measures are calculated for each track in each well of a well plate and saved for further statistical analysis WIS-PhagoTracker supports all the analysis phases starting from preprocessing, finding tracks of selected wells or a whole plate, through viewing the results and manually rejecting tracks to statistical analysis of the results. 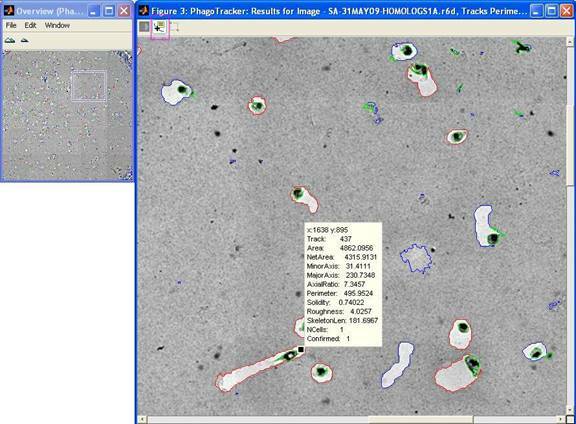 It also supports batch processing of several plates, and analysis of single image files. A user interface enables the user to modify the relevant parameters of the process, according to specific image's requirements. Results are exported into Excel readable files. Download needs password from the author.